Seves glassblock is a business unit of The Seves Group, the world's leading manufacturer of glass and composite insulators for power transmission and distribution systems, and of glass blocks for architectural and interior design applications. Seves glassblock owns 36% of the world's glass block production and distribution market. 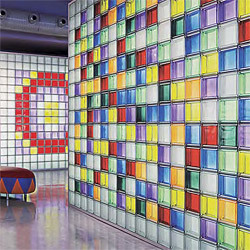 With nine different colours, a neutral line, and 200 different glass designs, Seves glassblock has a 40% share (in terms of value) of the world glass block market. The collective traditions and in-depth expertise of the most prestigious brands in the international glass block segment: Vetroarredo, Solaris, Vitrablok, Vidromatone, and Sindoco, have been united together under Seves glassblock. Today, Seves glassblock provides high-quality products, with superior technological contents and strict structural standards, while respecting both the environment and consumer.